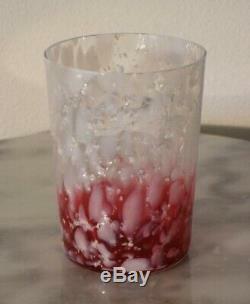 Here is a very pretty Victorian era art glass 4 talll Tumbler. Made by the Phoenix Art Glass Co. At over 100 years of age it is a true Antique. Very clean inside with no stains or mineral deposit. This is Rubin art glass marvered in White Opalescent flakes and Silver Mica. There are the normal tiny air bubbles and carbon dirt specs embedded in the glass but nothing that detracts. Any unusual white or dark spots shown in the photo is from camera glare. This is a real beauty. This will make a great addition to any Victorian home. The item "Victorian Phoenix Art Glass Rubina Tumbler White Opal Flakes Silver Mica" is in sale since Thursday, February 7, 2019. This item is in the category "Pottery & Glass\Glass\Art Glass\North American\Other North American Art Glass". The seller is "ainventor" and is located in Gibsonton, Florida. This item can be shipped worldwide.